Charleston is such a nice city. For the most part, it is pretty laid back and a decent place to live. But just yesterday, there was a something going on down by Women’s and Children’s Hospital at the Martin Marietta gravel yard. Folks who were in the area said they heard a buzz, and then the sky was darkened by flying creatures that (they later found out) were scouting for a new home. 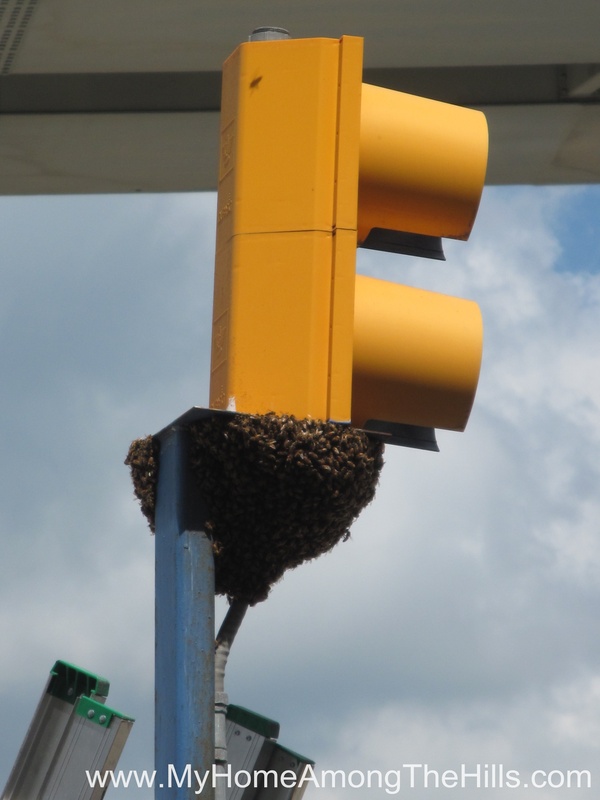 Eventually, the creatures found their mark…a swarm of bees landed on the stop light for the truck scales at the gravel yard…and that my friends, is why bees will never rule the world. I am thankful that the yard guys (and gal) called WV DNR who called me. I was able to run over at lunch yesterday and catch this excellent swarm. They were pretty gentle and appeared to be healthy and vigorous. After work (and hours after their capture so they had time to calm down), I was able to find a good looking queen so they should be a good colony. Anyhow, I showed up to get these bees in my work clothes…you know, dress shoes, nice pants, etc. 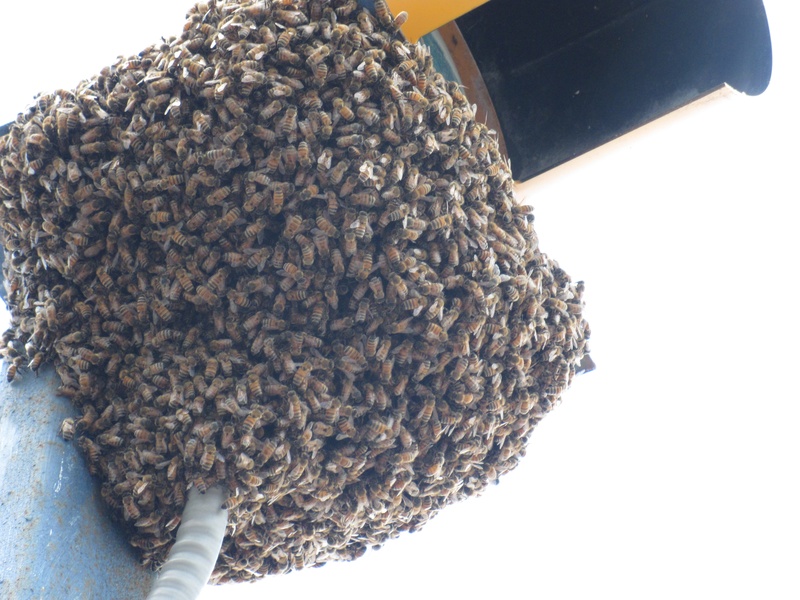 I think I mentioned that the swarm was in a gravel yard, right? It had rained the night before so it was a muddy mess (as was I). 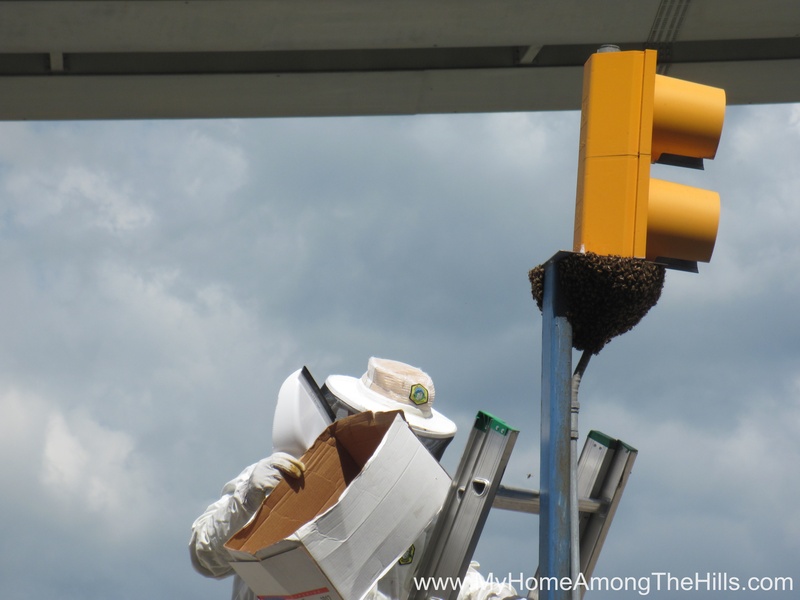 Anyhow, the foreman brought me a ladder and stopped traffic on the scales and I was able to scoop the swarm into a cardboard box using a dust pan (yes, I have learned these tricks the hard way). 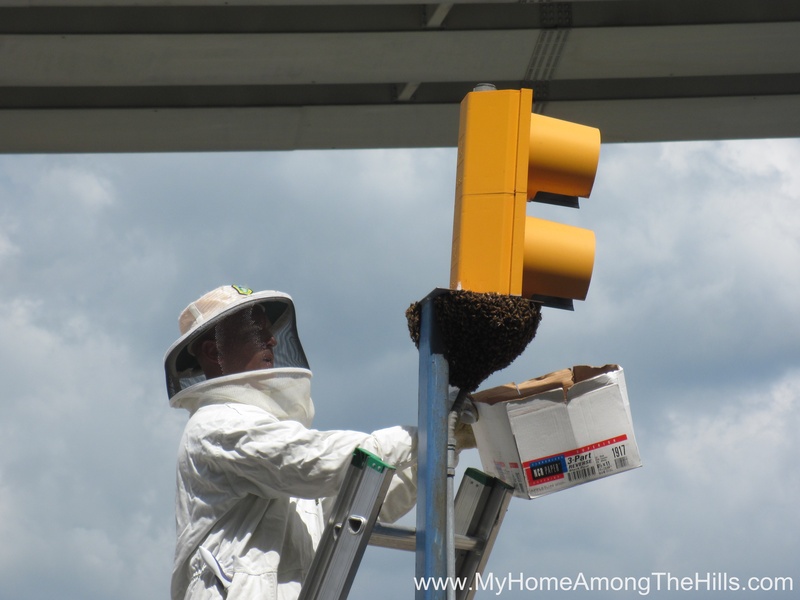 When on a ladder, it is best to have something light into which the bees can be placed for the trip down the ladder. Old paper boxes work perfectly! Anyhow, I scooped the majority of the bees into the box and carried it down the ladder where I dumped them into the hive I had waiting. I waited about 10 minutes and the ones I missed smelled the queen in the hive and followed after her. It’s just how swarm catching is supposed to go! I love catching swarms. I think my favorite part is the crowd that invariably gathers to “watch the crazy bee man on a ladder”. 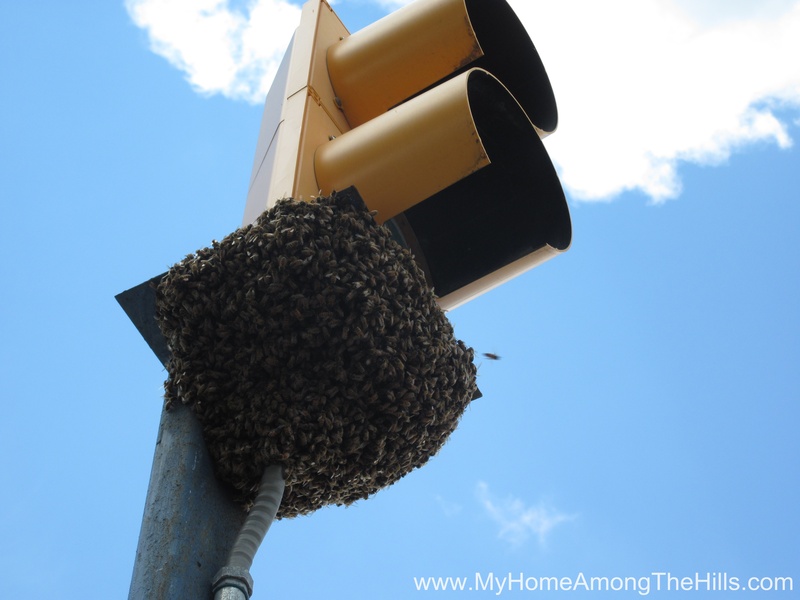 The really cool part is when I (didn’t) load the hive into my van to drive them home. The guys thought (not really, because I didn’t really do it) I was doubly crazy! Anyhow, the folks at the gravel yard were really helpful and had lots of questions so this was, in all ways, a great swarm to catch! 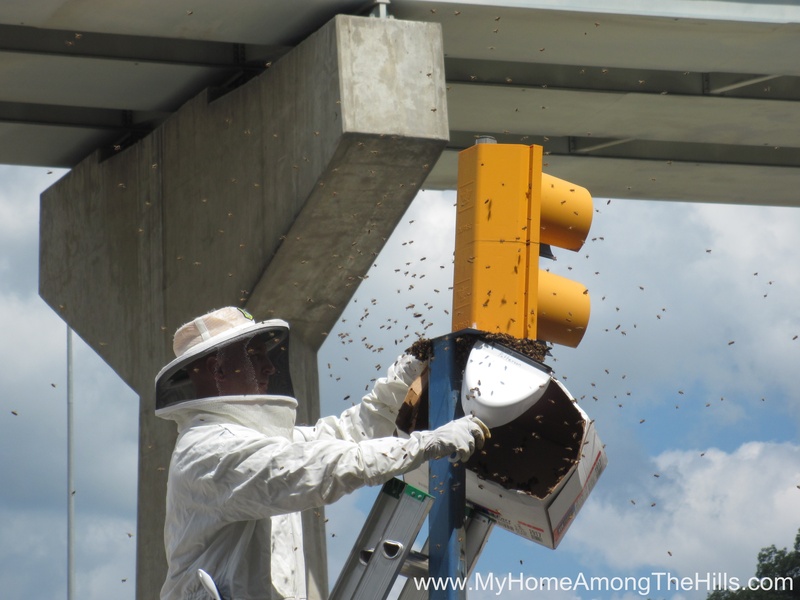 Question, how many new hives have you set up this spring because of swarming? Second question, shouldn’t the bees be long done with swarming? I thought it was purely a cool temperature, early spring activity. 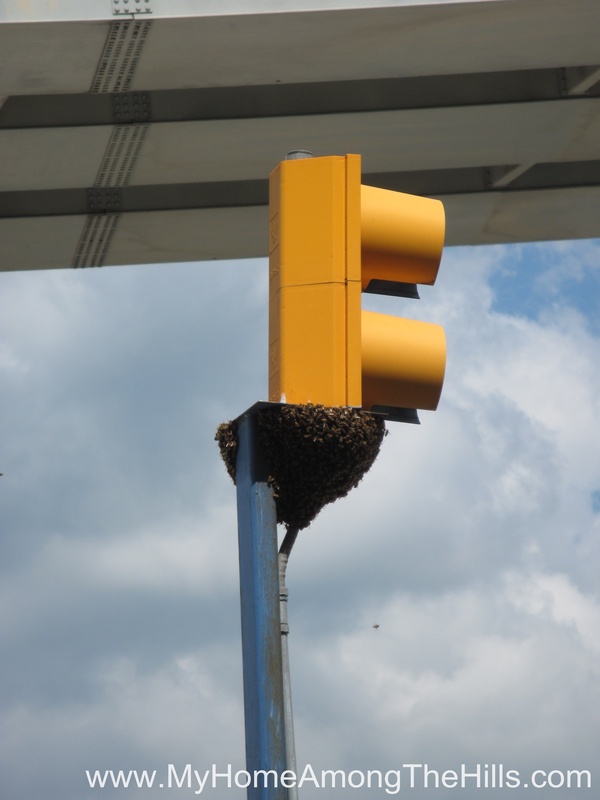 Observance–you know folks that watch the bee man get out of the car are wondering–“I hope that dude has a hat or something cuz his shaved head is perfect for stinging.” Just sayin. Ya know people like to watch men doing things they think is dangerous. You just like the thrill. Ceecee – the saying goes…a swarm in May is worth a load of hay, a swarm in June is worth a silver spoon, a swarm in July isn’t worth a fly…so we are cutting it close but are still in silver spoon territory. 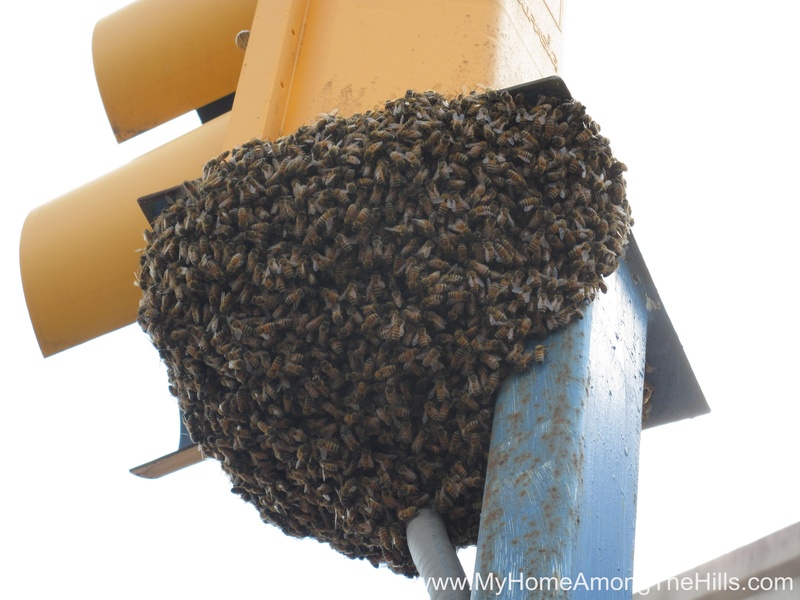 I have caught 4 swarms this spring…been busy! PA Grandma – hoping to see me fall on my hind-end with a box of bees I think! Yup, just like folks watch NASCAR–hoping for a wreck. “and that my friends, is why bees will never rule the world.” LOL! Good job! I’ve never seen a Bee Master in action(in person). Who needs superman when you have crazy bee guy?